I am so happy to be the sketch hostess this week over at Freshly Made Sketches! It always makes me a little nervous since we always want you to love our sketches and today I went with a bit of a classic look. I love a big oval as a place to show off images and dies. But I’m sure you will find ways to interpret this that I didn’t even consider. That always makes me happy! I used this pretty little flower from Julie’s Roses by Winnie and Walter. 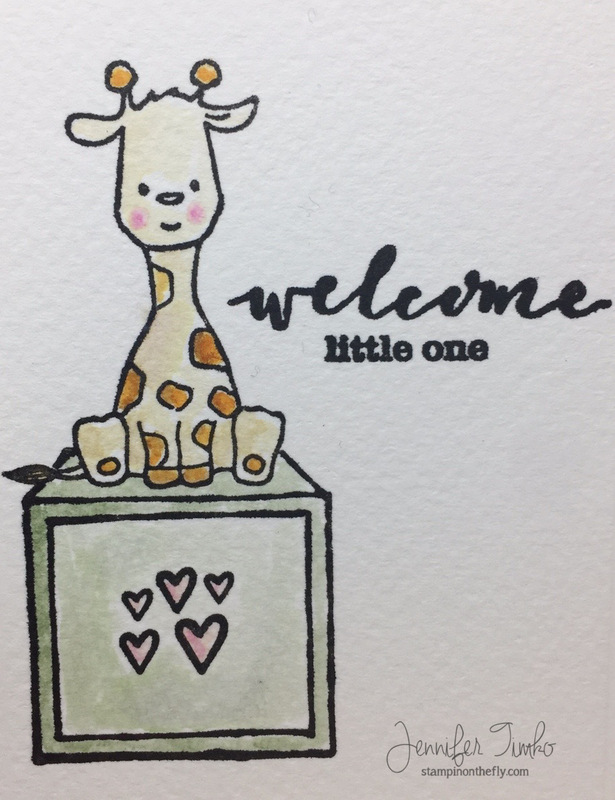 I stamped in Versafine Onyx Black and then colored with Zig Clean Color Markers. After coloring the flower and the leaves, I fussy cut them out. 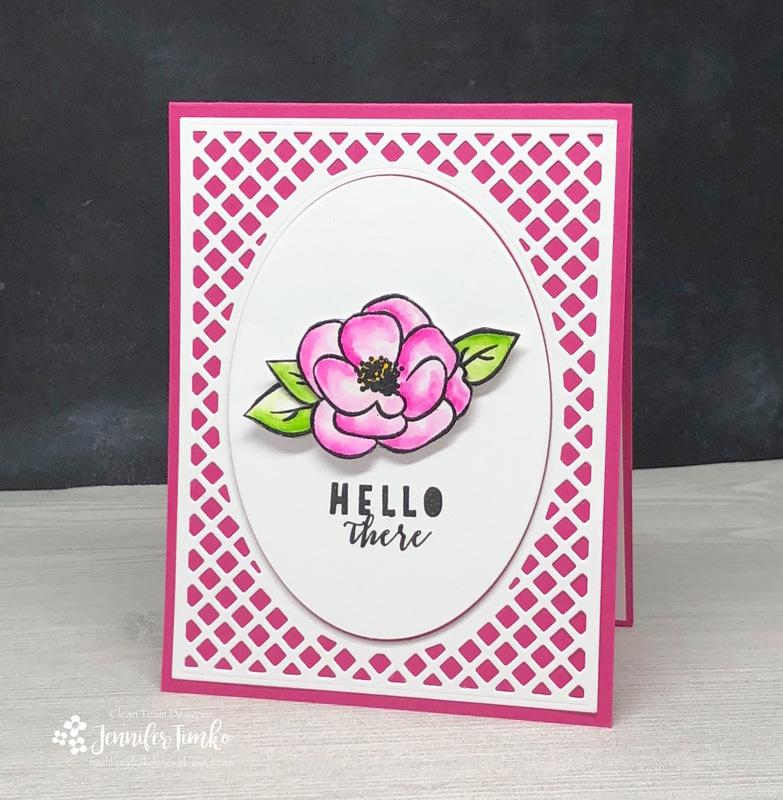 I thought this amazing Lattice Frame Cutting Die by Taylored Expressions was the perfect way to show off the flower. So much detail but not enough to distract from the focal image. Love it! The sentiment is also from Winnie and Walter in a set called Sketchy Thoughts. I used a base of Doll Pink by Simon Says Stamp to complete the look. Now I get to share some fun news! For the month of May, my friend Jill Hawkins will be joining us as a Guest Designer at Freshly Made Sketches. If you don’t know Jill, you should! She has the BEST sense of humor and oh by the way makes insanely great cards! We are thrilled to have her joining our happy band for the month. Well, I hope you like the sketch and that you will have a few minutes to play along. We are full up in soccer season here at my house (JV High School for the oldest, Middle School for the youngest and club ball all around). The good news….I get to see the boys doing what they love. The bad news, less stamping. It is a worthwhile tradeoff though. Hoping to hit the stamp room later today to make some stuff to share soon. Thanks for stopping in today! How is it already Wednesday again? My last week has been a bit of a whirlwind and I’ll share more about that later in this post. First, though, let’s talk about Freshly Made Sketches. Our sketch designer this week is my friend Jen Mitchell. She always makes the most lovely clean cards and her style is fantastic! She gave us a cool angled panel to use and I love the options with it. I started with this amazing wood grain stamp from Winnie and Walter called Into the Woods. Isn’t it fantastic?! Putting it on the angle seemed to just work well and I like not having to add a layer. Julie’s Roses (another Winnie and Walter set) gave me this lovely flower and the sentiment. The image looks colored but I actually just stamped using my Misti with the fill-in stamp from the set. I started with Altenew’s Citrus Burst ink and then layered on some Maple Yellow on the edges by re-stamping. The leaves are stamped the same way with Altenew’s Frayed Leaf and Forest Glades inks. I fussy cut the images and added some sequins for a little extra touch. Now for a little more about me. Last Wednesday, I left on the most wonderful adventure. I was invited to attend a retreat at the Whatever Craft House. Just go look at that incredible house….Yes, click now. I’ll wait. Stamping Away March 2018 was truly a retreat full of inspiration and laughter. I met new friends and some of my stamping idols. All of them were so kind and welcoming. The retreat actually has sponsors that are incredibly generous and I can promise you’ll be seeing the products I received over the next weeks and months (yes, there really is that much!). I want to share one picture of me from the house. These colored stairs are a bit iconic to the house and I remembered to get a photo on the last day. Yes, I was a bit tired (hard to sleep when there is that much stamping to do!) but really happy. 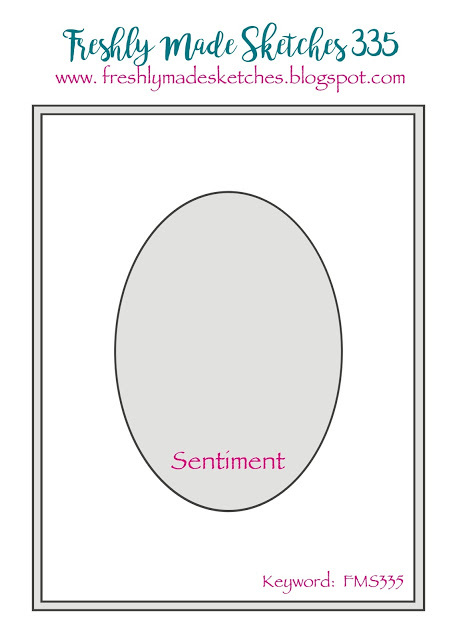 As I sat down to create the card for today, I admit that my creative brain was a bit scattered. So I chose the Winnie and Walter stamps because Shay (who IS Winnie and Walter) was at the retreat. And she is such a fun person! I so enjoyed meeting her and watching her create with her own images…talk about insight into design. She has a crazy amount of talent but is so down to earth. And she was insanely generous to all of us at the retreat! 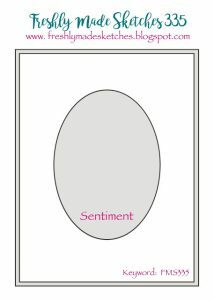 I hope that you love this card and that you’ll have time to play along with our sketch. Also, we have a new guest designer for the month of March. Make sure you stop by to say hi to Claire Apostoloff. Thank you so much for stopping in today. I hope you have a wonderful crafty day!